The Chilean forward made his Manchester United debut last night. Manchester United attacker Alexis Sanchez. MANCHESTER UNITED MANAGER Jose Mourinho was impressed by Alexis Sanchez’s debut for the club, but said it came as no surprise. 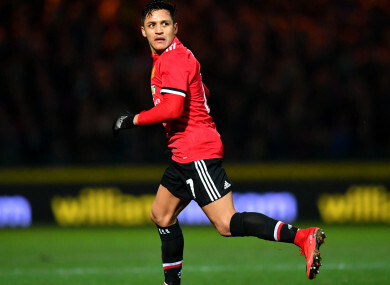 Sanchez made his first appearance for United since joining from Arsenal earlier this month, helping his side to a 4-0 thrashing of Yeovil Town in the FA Cup on Friday. The Chile international set up Ander Herrera for United’s second goal before coming off in the 72nd minute. Mourinho praised the 29-year-old, who headed to Old Trafford after three and a half seasons at Arsenal. “I’m very happy. No surprise for anyone, three and a half years in the Premier League playing every week and everyone knows what Alexis is,” he said. “He’s the kind of player that you buy and you don’t put a question mark in front, you don’t think about adaptation or something like that in relation to English football. “So no surprise for us, fantastic player, he showed that for three years, he showed that for the past three days he was training with us. He’s an amazing addition for us. “He needed to play. I was not sure about 90 minutes, I wanted to go for 60, 75 and was good. Sanchez’s next chance to impress could come in a far tougher clash, with United visiting Tottenham in the Premier League on Wednesday. Email “Mourinho unsurprised by Sanchez display”. Feedback on “Mourinho unsurprised by Sanchez display”.